I've decided there is NO WAY I'm getting 3 months behind in the Sisters' Ten BOM at Gen X Quilters. Absolutely not. So, as of last night, I went on a block-making spree. It's suggested that we make at least 2 of each pattern, and I realize that I only have 8 blocks so far for the year... lol. Whoops. While I wait for one or more of my three rulers to reveal themselves, I thought I'd give you a "real" glimpse of my Sunday. 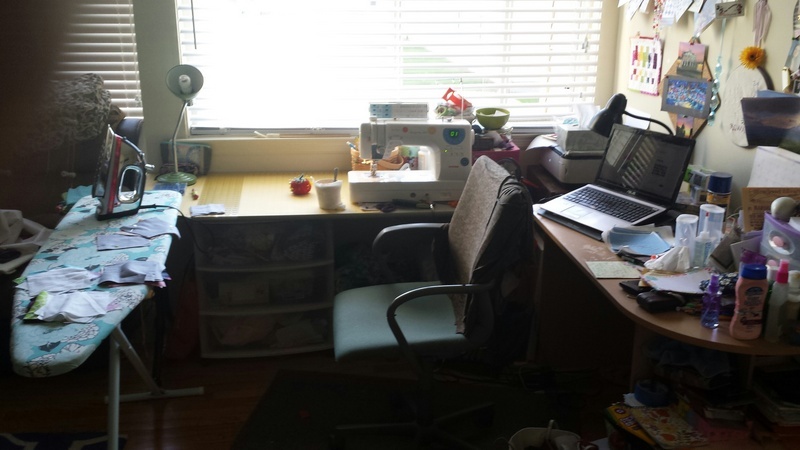 This is my permanent temporary set-up , with the iron right next to my machine. Remind me why I haven't done this before? 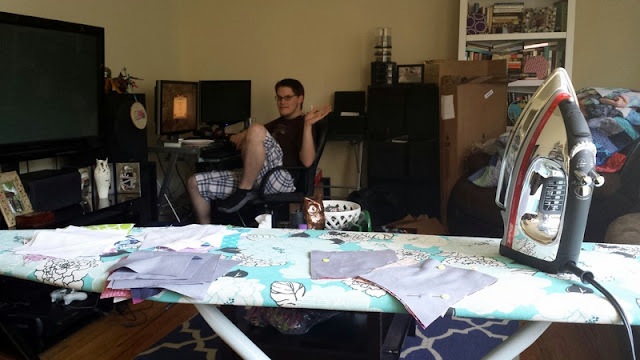 I love sewing in the same room as Mike, while he's playing video games or chatting on the computer. Even though our apartment is small, it's really nice to be able to do that :) Plus, I can show him blocks as I finish them, and he obediently compliments them. Lol :) And if he finds a funny video or something, I can see it, or come right over. I took this picture last night and didn't realize it was so blurry until now... oh well. 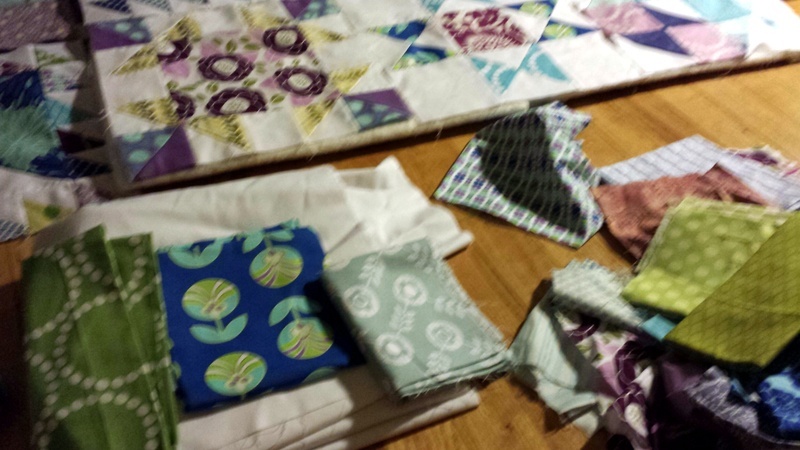 Light isn't so great in here at night, which is why I'm doing so much cutting and piecing right now. Main point: fabric selection is definitely my favorite part of this BOM! We plan to visit our families and take a walk in a bit :) Though I haven't worked with Sunnyside yet... I'm still deciding what to do. Stay tuned for part two of BOM madness! I love sewing in the same room as my husband too. It isn't the best set-up, but it's nice being close to him, even when we're not talking. I love having an ironing table right next to my sewing machine! Unfortunately with two little ones around it's not very practical or safe most of the time. Look forward to seeing your blocks! Heh. I'm behind, too. I cut some of the blocks but I haven't sewn them together yet. After 36 years of marriage, I still like the evenings we sit side by side in the lounge room -- sometimes watching TV together, sometimes one watching and the other doing something else and sometimes both doing our own thing -- but always together!